The year is 1985. East Germany is in the grip of communism. Magda, a brilliant but disillusioned young linguist, is desperate to flee to the West. When a black market deal brings her into contact with Robert, a Scottish research student at Leipzig University, she conceives a plan to escape. Robert stumbles into a complex world of shifting half-truths - one that will undo them both. 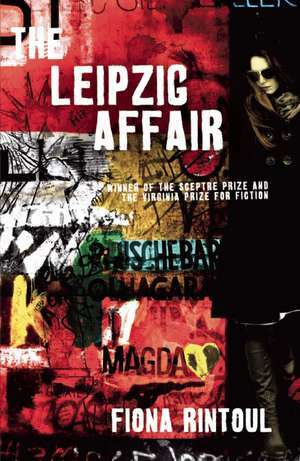 More than a decade later, Robert returns to post-communist Leipzig in search of answers. Can he track Magda down? And will the past give up its secrets? Fiona Rintoul is a writer, journalist and translator. While studying German at St Andrews University in the 1980s, she was an exchange student at Leipzig University. Her experience of living and studying behind the Iron Curtain was the start of a lifelong interest in the former East Germany that culminated in The Leipzig Affair. Fiona's writing has appeared in anthologies and magazines, including Mslexia and Gutter. Outside Verdun, her new translation of Arnold Zweig's first world war classic, Erziehung vor Verdun, was published by Freight Books in May 2014. She is a graduate of the Glasgow University creative writing programme and a past winner of the Gillian Purvis new writing award and the Sceptre prize. As a journalist, she has received a State Street institutional press award and an IJP George Weidenfeld bursary for British and German journalists. Fiona lives in Glasgow. Fiona Rintoul is a writer, journalist and translator. Her poems and short stories have appeared in anthologies and magazines, including Mslexia and Gutter, and she is a past winner of the Gillian Purvis New Writing Award and the Sceptre Prize. She translates from German and French into English and recently completed a new translation of the first world war German classic Erziehung vor Verdun by Arnold Zweig. It was published as Outside Verdun by Freight Books in May 2014 to mark the centenary of the start of the First World War. Fiona’s journalism concentrates on financial topics, and she also writes travel pieces and reviews. She was one of the journalists of the year in the 2012 State Street institutional press awards. She has a particular interest in Germany and is a past participant in the IJP British-German Journalists’ Exchange programme. Fiona lives in Glasgow.